A Soyuz rocket is set to launch from South America with six satellites Friday to serve European defense agencies and Chilean security authorities. 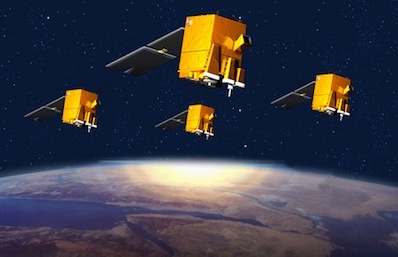 The Russian booster is hauling France's Pleiades 1 imaging platform, four French ELISA electronic intelligence satellites and the SSOT Earth observation satellite for Chile. Liftoff is set for 0203:08 GMT Saturday (9:03:08 p.m. EST Friday) from the Guiana Space Center, a European-run spaceport on the northeast coast of South America. It is the second Soyuz mission staged from French Guiana. Another launcher successfully delivered two European Galileo navigation satellites into orbit in October. The three-stage Soyuz rolled from an integration building to the launch pad Monday morning. The rocket's nose shroud, payloads and Fregat upper stage were attached later Monday. The Soyuz 2-1a rocket, a modernized version of the Soviet-era launcher, will haul the payloads to different orbits in a more than three-hour mission. Friday night's blastoff is the first polar orbit mission for the Soyuz from South America. The 151-foot-tall launcher will pitch north from the space center, flying over the Atlantic Ocean before reaching orbit. The orbit is sun-synchronous, meaning the satellites fly over regions of Earth at the same time each day. It is a coveted type of orbit for Earth observation satellites and users relying on consistent imagery of zones across the globe. The Soyuz will propel itself to space in less than 9 minutes, then the launcher's Fregat upper stage will ignite twice to accelerate to an orbit nearly 435 miles high. The mission's six satellite passengers are fitted to an ASAP-S adapter, a multi-spacecraft platform designed to accommodate auxiliary payloads above, below and around its perimeter. The 2,138-pound Pleiades 1 satellite, about the size of an SUV, will deploy from the Fregat rocket stage 55 minutes after liftoff. 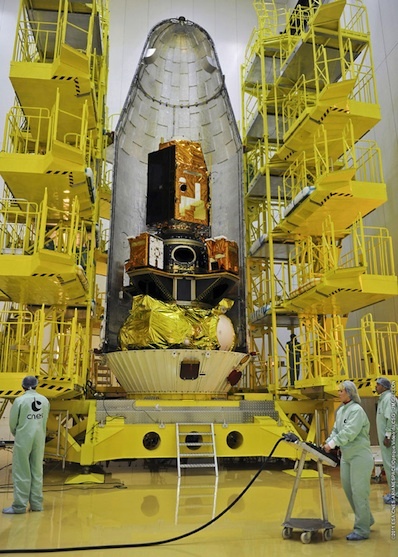 Four minutes later, the French government's ELISA satellites will simultaneously release from the APAS-S adapter, according to Arianespace, the commercial operator of the Soyuz rocket. The Fregat will fire its engine two more times to lower its orbit to 379 miles before casting free the SSOT reconnaissance satellite for Chile about 3 hours, 26 minutes into the flight. 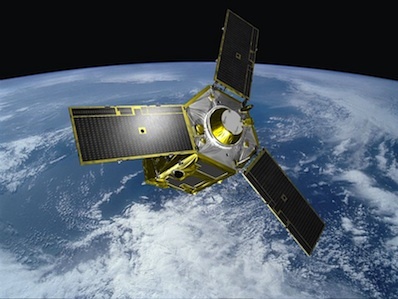 Pleiades 1 is the first two satellites developed by CNES, the French space agency, to serve military and civil users. The Pleiades system is also partially funded by Belgium, Sweden, Spain and Austria. Spain and Italy will receive priority data for military needs under separate agreements with the French defense ministry. Italy and France share data from radar and optical observation satellites for defense purposes. The ORFEO agreement calls for imagery from Italy's COSMO-SkyMed radar satellite system and France's Pleiades optical program to be distributed to both nations. The Pleiades satellites each carry a Korsch telescope with a primary mirror 2.1 feet in diameter. Its CCD detectors are 40 times more sensitive to light than those in standard consumer digital cameras, according to CNES. Built by Astrium of France, Pleiades 1 will collect up to 450 images per day with a peak resolution of 70 centimeters, or about 2.3 feet. CNES says special processing can sharpen the images to a resolution of 50 centimeters, or less than 20 inches, placing the satellite among the top commercial observation platforms worldwide. U.S. commercial satellites provide imagery with a resolution of 16 inches, but data for civilian customers are blurred to a resolution of about 20 inches to meet the U.S. government's regulatory requirements. The U.S. Defense Department only receives the best imagery. Astrium Services will sell Pleiades imagery, along with data from the Spot satellite series, to commercial customers and governments beyond Europe. Astrium also manufactured the quartet of ELISA satellites and Chile's SSOT spacecraft. The ELISA program is a partnership between CNES and the French defense procurement agency DGA. Each satellite weighs about 265 pounds. Flying together in orbit, the ELISA satellites will locate and characterize radar sites around the world during a three-year mission. According to the French defense ministry, the DGA and the military's intelligence division will explore uses for the electronic intelligence satellites. French defense officials hope ELISA will help create a catalog of radars for electronic warfare, according to CNES. The 258-pound SSOT satellite is the product of a partnership between the Chilean government and Astrium that included the development of ground control and image processing systems, giving Chile the ability to operate the satellite from within its own territory. SSOT's 4.8-foot resolution images will be employed in mapping, agriculture, city planning, and natural resource, risk and disaster management. The satellite will also be used for national security applications.